Electronic seals radio frequency pulse tunes out data and sends to control logistics and control logistics receive order and finish storage, send data or other operations. eeprom is used to store electronic seals ID number and other user data. RFID system can also be divided to low frequency, high frequency and super-high frequency system according to difference of working frequencies. Low frequency system normally works during 100khz~500khz while high frequency system normally works during 1mhz~15mhz. They are mainly suitable for identification of short distance, while super-high frequency system can reach 850mhz~950mhz and 2.4ghz~5ghz. The microwave band is suitable for long identification distance and high reading data frequency. 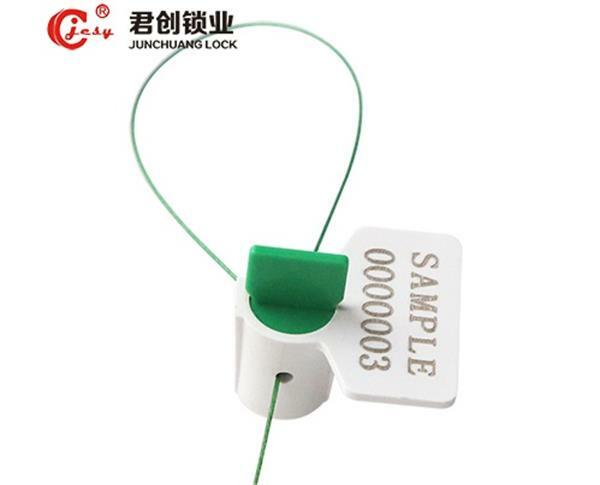 As the data carrier, chips of electronic seals can play the role of mark and identification, goods tracking, information collection. RFID system composed by electronic seals, reader, antenna, and application software directly connects with corresponding management information system. Each sealed object can be exactly stalked. Such complete information management system can bring much benefits to customers, including free collection of real-time data, safe data storage passage, and obtaining product information at off-line state.